October 5, 2019, 10 a.m.–3 p.m.
Join us for our Fall Garden Market, part of the Martial Cottle Park Harvest Festival. The Harvest Festival celebrates the agricultural heritage of the Santa Clara Valley and the newest park in the county. There will be food, entertainment, park tours, and more. Our Fall Garden Market plant sale offers a bounty of winter vegetable and flower seedlings plus beautiful low-water succulents. They all thrive in our cool winter conditions and will keep your garden producing year round. Come get inspired! Arrive early for best selection. 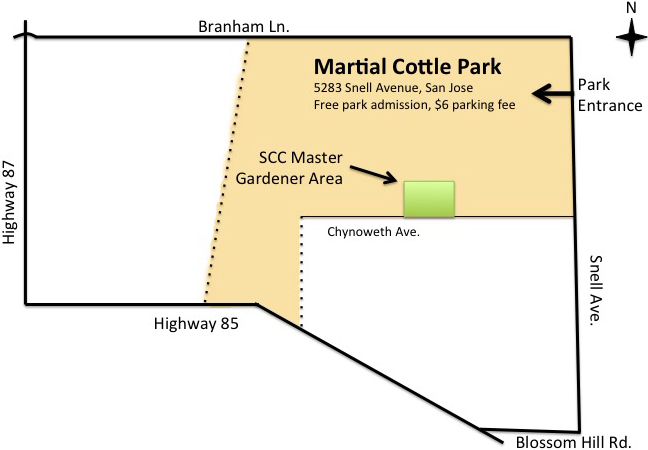 Sales benefit the UC Master Gardener program. We will also have talks by UC Master Gardeners, children's activities, a Green Elephant sale, and an “Ask a Master Gardener” booth where you can ask questions and bring in samples for diagnosis. Here in Santa Clara County, we can grow delicious vegetables year round. Our market will offer a wide variety of vegetable seedlings that thrive in our cool season and provide you with fresh produce all winter long. Come talk to us and get tips for success with winter vegetables. See our Vegetable Planting Chart for a month by month guide on when to plant different vegetables, developed specifically for Santa Clara County. All seedlings are sold in six-packs unless otherwise noted. Arrive early for best selection. Some varieties may sell out quickly or be in short supply. A selection of flowers, ornamental plants, and succulents will also be offered. Please note: Not all varieties will be available at all plant sales. OP: Open-pollinated. Seed saved will breed true to type. Thick, juicy stalks, young leaves and flower buds are tender and delicious. Can harvest shoots repeatedly for weeks. Ready in 30 days. Great for greens or stir-fry. Slow to bolt. 8–10" tall. Plant 8–12" apart. Smooth, spoon-shaped leaves in a compact rosette. Mild flavor is perfect for salads or stir fries. 6–10" tall. Plant 6" apart. Deep reddish-purple leaves are popular as baby greens in salads. Roots display pretty pink rings when sliced crossways. 8–12" tall. Plant 4–6" apart. Old Italian heirloom beet known for its red & white candy–striped rings and mild, sweet flavor. Named after a fishing town in Italy and pronounced ‘kee–OH–jaw’. 8–12" tall. Plant 4–6" apart. Popular heirloom beet, uniform and smooth, with sweet red flesh and tasty 14" tops for greens. 10–14" tall. Plant 4–6" apart. Tasty, fine-textured beet in a convenient long shape that is easy to peel and slice into rounds. Delicious leaves too. 8–12" tall. Plant 4–6" apart. Sweet golden beets are mild and tasty. Beautiful in salads. Greens are delicious and mild. 8–12" tall. Plant 4–6" apart. Four-pack. Large 6–8" main head plus side shoots on this very early broccoli. 18–24" tall. Plant 12–18" apart. Four-pack. Large 6–8" main head followed by plentiful side shoots which will continue all winter long. Later than Packman. 18–24" tall. Plant 12–18" apart. Four-pack. Easy-to-grow baby broccoli produces dozens of tender, tasty heads with an asparagus-like flavor. 20–24" tall. Plant 24" apart. Four-pack. Medium-sized 3–6" main head followed by numerous side shoots for months afterwards. 24–30" tall. Plant 12–18" apart. Four-pack. Tasty large (10-inch) light blue-green main head followed by lots of side shoots which will continue through the winter. 18–24" tall. Plant 12–18" apart. Four-pack. Delicious heirloom variety with plentiful side shoots. 18–24" tall. Plant 12–18" apart. Mixed four-pack of broccoli. A great way to try several varieties! Plant 12–18" apart. Four-pack. Heirloom variety with 2–3 lb pointed heads that are solid, sweet, crisp and delicious. Compact plants can grow close together. 12–15" tall. Plant 24–30" apart. Four-pack. Heirloom variety with crisp, deep purple-red heads, fine flavor. 5-lb heads, 8–10" across. 12–15" tall. Plant 24–30" apart. Four-pack. Dense, juicy heads, firm and sweet. 10–12" tall. Plant 10–12" apart. Mixed four-pack of cabbage. A great way to try several varieties! Plant 12–24" apart. Four-pack. Classic cauliflower, pure white, deeply domed, self-blanching, delicious. 18–24" tall. Plant 24–30" apart. Four-pack. Like a regular cauliflower, but orange! Sweet and tasty, with about 25 times as much beta carotene as white cauliflower. No blanching needed. Delicious and striking. 18–24" tall. Plant 24–30" apart. Four-pack. Neon purple cauliflower keeps its color when cooked. Makes a great addition to any raw vegetable platter. The 10" heads do not require blanching. For a surprise, dress raw or cooked Graffiti with vinaigrette and watch it turn a bright magenta pink. 18–24" tall. Plant 24–30" apart. Four-pack. This Italian heirloom, Verde di Macerata, forms beautiful light green heads with no blanching needed. 18–24" tall. Plant 24–30" apart. Four-pack. Light green heads with incredible swirls that form amazing fractal shapes. Sweet nut-like taste. 18–24" tall. Plant 24–30" apart. Four-pack. Early snowball type is pure white, round and flavorful, weighing up to 2 lbs. each. 18–24" tall. Plant 24–30" apart. Mixed four-pack of cauliflowers. A fun way to try different varieties! Plant 24–30" apart. Gorgeous stems are red, yellow, gold, orange, white, pink, violet, and striped. Delicious and tender. Multicolored stems and leaves make a wonderful show. 18–24" tall. Plant 12–18" apart. Thick green leaves are large and tender, on huge, white stalks that are very wide and delicious. Heavy yields because leaves are so large. 18–24" tall. Plant 12–18" apart. Beautiful thick golden stems and savoyed green leaves hold color well during cooking. Excellent flavor, never tough or bitter. 18–24" tall. Plant 12–18" apart. Beautiful chard with hot pink and white striped stems, delicious as well as ornamental. 18–24" tall. Plant 12–18" apart. Four-pack. Fresh cilantro leaves have an intense and tangy flavor. Allow the seeds to develop for fresh coriander seeds. 10" tall. Plant 6–8" apart. Four-pack. Prized variety for culinary use. 12" tall. Plant 12–18" apart. Green chicory looks like a romaine lettuce but has that distinctive and delicious sweet/bitter chicory flavor. 12–18" tall. Plant 12" apart. Beautiful pale green leaves become golden blonde when blanched. Delicious raw in salads or cooked. 8–12" tall. Plant 12–18" apart. Large full heads with delicious finely cut, frilled leaves. Blanch heads tying outer leaves together 2 to 3 weeks before harvest. Holds well in garden, slow to bolt. 8–12" tall. Plant 12–18" apart. Beautiful tennis–ball sized radicchio is crisp and delicious. Reliable header, resistant to disease. 8–12" tall. Plant 12" apart. Plentiful shoots have a delicate slightly bitter/spicy/peppery flavor. 12–18" tall. Plant 6–10" apart. This striking kale features blue-green savoyed leaves with dramatic pink midribs. Upright growth. New from Wild Garden Seed. 24–30" tall. Plant 12–18" apart. Heirloom Italian variety is a gorgeous, striking plant with delicious dark blue-green leaves. 24–36" tall. Plant 18–24" apart. 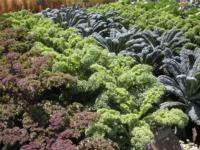 You'll get a beautiful variety of colors, textures, sizes and flavors with this special five kale blend (Dwarf Blue Curled, Improved Dwarf Siberian, Lacinato, Premier, and Red Russian). 24–30" tall. Plant 12–18" apart. Tasty and ornamental kale with red veins will prolifically produce sweet, tender young leaves all winter long. 24–30" tall. Plant 12–18" apart. Portuguese variety. Paddle-shaped, deep green leaves with mild, rich flavor. 24–30" tall. Plant 12–18" apart. More tender texture and sweeter flavor than mature kale leaves makes this wonderful for salads. Plant close together and harvest when just 4–5" tall, leaving crown to regrow for multiple harvests. Four-pack. Beautiful mustard, both ornamental and tasty. Harvest young leaves for salads or larger leaves to cook. Striking in a border. 8–24" tall. Plant 4–6" or 12–18" apart. Four-pack. Stunningly beautiful mustard, with feathery, ruby red leaves. Delicious in salads and stir-fries. A perfect ornamental edible. 6–12" tall. Plant 4–6" apart. Four-pack. New variety from Japan developed for a tangy, hot flavor like wasabi. Pick small for mild, delicate flavor or large for robust, spicy flavor. 8–24" tall. Plant 4–6" or 12–18" apart. Four-pack. Long, thick leek grows strong and vigorously, with a delicate and delicious flavor. Up to 2 inches across. An old European heirloom variety. 18–24" tall. Plant 4–6" apart. Four-pack. Improved version of Stockton Early Red. Deep red, flat, and sweet. 10–12" tall. Plant 4–6" apart. Four-pack. Sweet and mild Spanish white onion with thick rings, stores well for 2–3 months. Day neutral. 10–12" tall. Plant 4–6" apart. Four-pack. These purple-red torpedo-shaped onions are an Italian heirloom with a rich, mild, sweet flavor. Intermediate day. 10–12" tall. Plant 4–6" apart. Four-pack. Blend of Red Robin and Green Feast scallions. Great color, heat tolerant, disease resistant. 10–12" tall. Plant 1–2" apart. Harvest delicious outer leaves for a constant supply. Cabbage/kale flavor. 24–36" tall. Plant 12–18" apart. Superior bulbing fennel, large and uniform, with great flavor. Flowers attract beneficials and swallowtail butterflies will lay eggs on the feathery greens. 24–36" tall. Plant 10–12" apart. The white flesh inside these alien looking vegetables is deliciuosly sweet and juicy. Can be eaten raw or cooked. Mix of green Kongo and purple Kohlibri varieties. 8–10" tall. Plant 4–6" apart. Classic purple-shouldered rutabaga with pale yellow flesh. Smooth, round roots have excellent flavor and texture. 15–18" tall. Plant 12" apart. Large, fine-fleshed turnip with sweet, pale golden flesh. Tasty raw or cooked. 8–12" tall. Plant 8–10" apart. Heavy yields of fine-flavored peas on vigorous plants. Heirloom variety. Best on a short trellis. 3–4' tall. Plant 4" apart. Large pods of delicious peas on tall vines. Heirloom variety. Needs a trellis. 6' tall. Plant 4" apart. Heirloom variety with sweet 4–5" long flat pods are borne on vigorous vines. 4–5' tall. Plant 3–4" apart. Vigorous vines yield heavy crop of delicious, edible-podded sugar snap peas. Healthy and mildew resistant. Thick, juicy pods are great raw or cooked. 5–6' tall. Plant 3–4" apart. Delicious salad greens with deep, spicy flavor. Will resow if allowed to go to seed. Flowers are edible too. 8–10" tall. Plant 3–6" apart. Tender, semi-romaine type with a buttery texture, green leaves blushed with red. 5–7" tall. Plant 8–10" apart. Loose butterheads with sweet, crisp, thick, delicious leaves. 5–7" tall. Plant 8–10" apart. Thick, crisp and succulent dark red leaves on extremely heat resistant crispheads. Beautiful and tasty. 6–8" tall. Plant 10–12" apart. Red romaine heads, tall, crisp, and delicious, slow to bolt. Heirloom French variety. 5–7" tall. Plant 8–10" apart. Distinctly red looseleaf lettuce, slow bolting. Taste test winner in our red lettuce trial. 12–14" tall. Plant 8–10" apart. Delicious blend of gourmet lettuces. Plant closely (2–4") for cut and come again harvesting or space apart 8–10" for heads. Miniature green romaine with sweet, blanched heart, a gourmet treat. 4–6" tall. Plant 6–8" apart. Crunchy, juicy green leaves can be harvested individually or as the entire head. Heat tolerant and sturdy, this crisphead lettuce is beautiful in the garden. 6–8" tall. Plant 10–12" apart. Large emerald green butterhead, delicious and slow to bolt. 6–8" tall. Plant 8–10" apart. Miniature green butterheads are just 3–4" across, perfect for individual salads. Heirloom from the 1850's. 4–5" tall. Plant 6" apart. Gorgeous mix of red lettuces for dramatic and delicious salads. Plant closely (2–4") for cut and come again harvesting or space apart 8–10" for heads. Tender red butterheads are beautiful and flavorful. 6–8" tall. Plant 8–10" apart. Gourmet European salad green. Small, low-growing rosettes of delicate, tender leaves, nutty flavor. Pick individual leaves or harvest entire head. 4–6" tall, plant 4–6" apart. Giant arrowhead-shaped leaves are sweet and crisp, on long stems held high off the ground. Vigorous plants will produce all winter long. 18–24" tall. Plant 8–10" apart. Tender deep green leaves with sweet, nutty flavor, on high-yielding plants. 10–12" tall. Plant 6–8" apart. New Dutch variety is heat tolerant for a long harvest period. Upright green leaves are crunchy and sweet. 4–6" tall. Plant 5–6" apart.